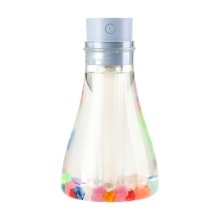 The design principle of this humidifier is designed into a wishing bottle based on the concept of lavender. The seven-color lighting is designed, and luminous stones are put into it. The whole is very beautiful.It can both moisturize the skin and purify the air. USB power supply, compatible with a variety of USB interfaces, easy and fast to use. High-quality fog mouth, quickly gather to reduce the drop out. The glowing stone absorbs light during the day and glows at night without a light guide. Beautiful and practical, always keep wet and refuse to dry. Last for about 10h on sustained spray mode, 16 – 20h on intermittent spray mode, low consumption.